So much fun! Ally loved Dora the Explorer when she was younger and really likes the older version now. Cooper on the other hand likes the younger version. I'm guessing this is the age difference in my children. Either way, we are fans of Dora the Explorer in this house! 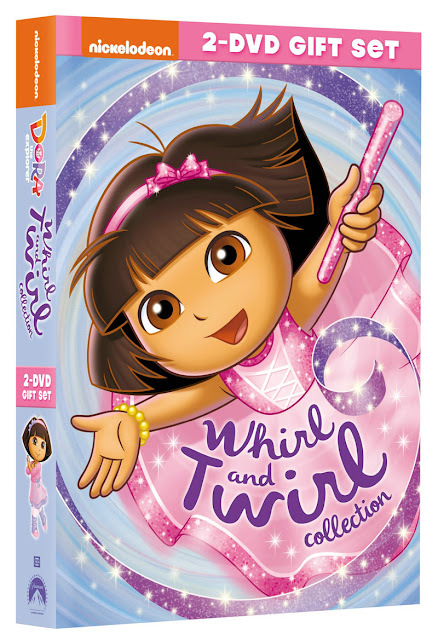 In this 2-DVD Gift Set, you get Dora's Fantastic Gymnastics Adventures and Dora's Ballet Adventure. While watching Dora's Fantastic Gymnastics Adventure, you'll also see 2 bonus episodes. Cooper really likes Swiper's Favorite Things. When you pop Dora's Ballet Adventures in, you'll get a choice of 4 total episodes. The Super Silly Fiesta is one of Ally's all time favorite episodes of all Dora the Explorer, so you know that one has been on repeat! Be sure to pick up this collection on June 2nd! We're loving it and I'm sure the Littles in your house will too! Dates: Starts May 31, 2015 8:00 pm EST. Winner will be chosen June 13, 2015 11:59 pm EST. I was in gymnastics from 3-8 years old and loved it !! I also did cheerleading through the YMCA and was able to use my gymnastic skills :) My daughter loves Dora and is 20 months old .. I would love to sign her up for gymnastics toddler class (Tumblers) when she is 2.5 years old :) TY for this chance !! my daughter did ballet when she was younger. loved watching her dance. i was the only one between the wife and I, that could get her hair up in the ballet bun. I don't have a memory for ballet or gymnastics! My kids doesn't participate in either! Thanks!! I haven't done either but I was really interested in gymnastics. Not as of yet. I have twin daughters who are 2 !! They both love to dance and LOVE Dora! My kids and I doesn't participate in gymnastics but I do love watching it during the Oylimpics!! Thanks! !